A few years ago, my family was vacationing in the Poconos. My brother Justin & I were sharing a room. There were a bunch of back issues of National Geographic that I was leafing through at night while I was laying in bed. In one issue, I opened to the middle of the magazine to see a group of Buddhist monks from the western China/Tibet area, sitting on the stairs of their monastery. 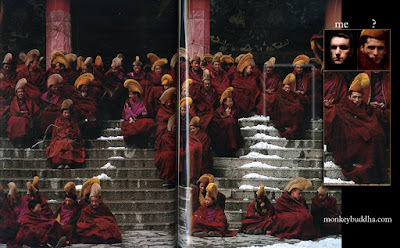 As I visually scanned the photo of the monks, one face was staring out of the page toward the camera. I exclaimed out loud in surprise- because not only did that monk not have Asian features at all... but it looked like an exact copy of my own face! I threw the magazine at my brother to look at. He told me excitedly that he had already seen it earlier & thought the exact same thing! Anyone who knows me & sees this picture would probably say the resemblance is uncanny. I am convinced that this is my Tibetan Doppleganger, staring back at me through The Void. I have always been especially interested in Tibet among the myriad cultures of the world, so maybe it is because my ethereal twin manifested there... Or not. Regardless of the supernatural implications of having a doppleganger in the Far East, I've taken the liberty of scanning the original pages and superimposing my own face next to the mystery monk for the sake of comparison. ...now it seems that people are already considering President Obama to be the total incarnation of evil. This seems to be mostly based on the fact that he is a charismatic personality. He hasn't proven himself to be a sociopathic, war-mongering plutocrat yet- so I'm reserving judgment for now. This segment would be enough of a gem without him, but Jason Jones interviews the great Pastor James David Manning, who proves to be as unashamedly insane as ever. 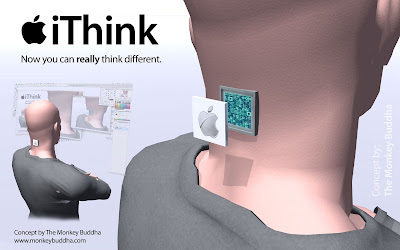 This past summer, I illustrated a concept I was kicking around in my head for a while - an "Apple iThink" computer of the future that actually fuses with the human nervous system. It connects directly to the brain via a Matrix-like connection in the head. The unit, though, would be wirelessly connected to a global network of both iThink users and other electronic communication devices. Apple's legion of loyal minions would be part of a techno-telepathic hive mind that I wrote about in my last post. 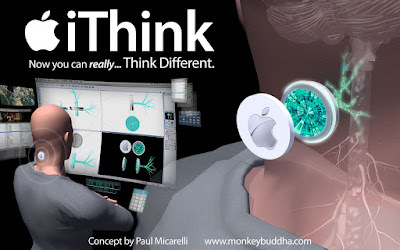 The "Apple iThink" is a thought experiment that should be equally intriguing and terrifying. Since I first posted the concept renderings, science has continued to progressed and made such devices closer to a reality. People have already been putting microchips in their bodies for one reason or another, so it's only a matter of increasing the complexity of the technology. The first image I posted didn't give enough of a sense of the multi-layered interface that a person would perceive in his area of sight. 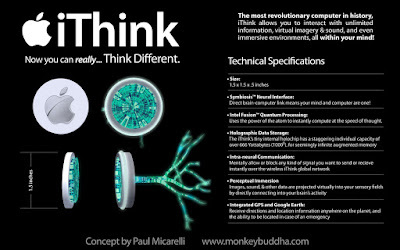 The iThink would be able to produce as many different visual representations as the user's imagination could handle. Since the iThink should also serve to augment the user's imagination, there is always the possibility that people might find themselves in a catatonic state of infinite visual immersion. Anyway, to better illustrate the multi-dimensional interface that such a device would create- I added some 'Mind Apps' throughout the model's visual field to get a sense of the multi-tasking such a device would allow. It's like the iThink got an upgrade to its virtual user interface. There are 100 billion neurons in the human brain. There are about 7 billion people on earth- maybe not enough to make a 'brain' yet, but the levels of connectivity permeating our lives is accelerating faster than any one person can fully grasp. 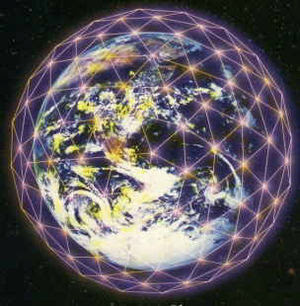 The world's becoming enveloped by broadband, satellites, wi-fi, cellular communication, and all the other magical ways people are exchanging information using pulses of patterned energy. An external hive mind is now steadily increasing in connectivity and content as each moment passes. When I was a kid in grade school, I knew there had to be a better way to learn and get new ideas than just the Encyclopedia or the Library. In the days before the emergence of the World Wide Web, though, I had no idea what that improved system could be. I just knew back then that getting information solely by looking it up in books really, really sucked. Now, we have instantaneous information, creativity, and communication through "The Web". Although I'm satisfied with the current state of the internet & its capabilities, the march of progress continues. As technology becomes more ubiquitous and wireless, it's becoming a networked cloud, continuously sharing the collective experiences of humanity. It seems we are becoming permanent participants in a technological mindstream. Perhaps we will soon be linked up to the hive mind via our iThink and be able to learn even the most difficult lessons instantly. Maybe one day we'll even shed physical networking systems altogether, when we discover how to tap into the Akashic Field. There is, of course, the crappier possibility that humanity will be destroyed before any of this happens. Aims to Reverse-Engineer the Mind "
"Evidence of a Global SuperOrganism"
"The Singularity: A Special Report"
"How Google is Making us Smarter"
Is a Giant Alien Hard Drive?" I randomly stumbled across a cool gallery of themed illustrations done by a group of professional artists. Once you start, it's hard to stop looking through each category. There is alot of great work that is fun to look at. Bizarro Super Chimp is just one example of the madness. For some reason, the randomized combination of existentialist ramblings of Friedrich Nietzsche with the playful characters of the Family Circus really amuses me. It's much better than the actual Family Circus comic. but much within you is still worm. than any of the apes." which we have forgotten are illusions." I saw this ^ video excerpt of Kurt Warner drawing & explaining God on the Cynical-C Blog. The concept of drawing "God" has always intrigued me. I never bothered such a thing, though, because I always recognized the absurdity of it. It's still interesting & kind of funny to see what people come up with.  The video led me to the website for a documentary called "God in the Box", which looks pretty cool. The gallery of drawings featured on the website is great. In my last post, there was a passing link to a legendary entertainer who I thought was awesome as a little kid. "Uncle Floyd", New Jersey's own Floyd Vivino, had a nutty show in the early 80's that was totally off-the-wall. Watching The Uncle Floyd Show is one of my earliest childhood memories. His free & funny style and general wackiness definitely inspired me to enjoy the ridiculous aspects of life - even to this day. People used to send in pictures they drew & he'd hang them up on his wall. I remember sending him at least one crayon drawing of his puppet, Oogie. Although I never spotted them on the wall, they might have ended up there at some point. Before starting elementary school, I was a free spirit & used to roam around my parents' house in various states of undress. Most of all, I hated wearing underwear when I was a little kid! So.... my Mom, who is a very creative problem solver, gave me a little pair of plaid shorts. She called them my 'Uncle Floyd underwear', based on his crazy plaid jackets. Since Uncle Floyd was so great to me, I enthusiastically started wearing my 'Uncle Floyd shorts'... all the time. Uncle Floyd is therefore responsible for the fact that I'm not freeballin' it everywhere! Thanks, I guess. For that, plus encouraging my young creative spirit & sense of humor, Uncle Floyd is a personality I'll always consider an early influence. 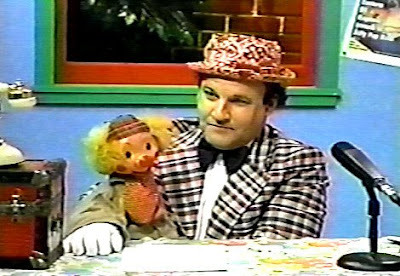 I just remembered.... in the 90's, years after his variety show, he had a cable show "Uncle Floyd's New Jersey" that my whole family would watch, too. Basically he would walk around towns in North Jersey. He'd randomly pop into businesses and talk to the employees and the customers. It was totally low-budget, but entertaining because it was so simple & real. Uncle Floyd endears pretty much everyone, so he would always get free food & friendly chatter. It was reality TV - before everyone else was doing it! That's why he's a pure genius. Floyd Vivino apparently still plays the piano at Colucci's Ristorante in N. Jersey & at other venues. He also has a radio show of Italian-American music. In his Wikipedia article, he claims to have the largest collection of Italian records in the world. I would love to meet him one day... he's probably a real trip. "For Uncle Floyd, Performing is All Relative"
Uncle Floyd lives on in the Digital Age!!!! I'm sure it's easy to stump with an unjustly obscure person. 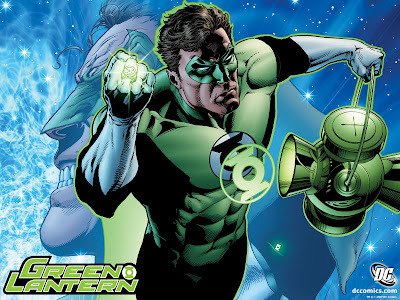 However, it correctly narrowed my answer down to 'The Green Lantern'. In high school I wrote a similar program for the TI-85 calculator I was using for some of my later classes. I made a chart naming a bunch of my friends, teachers, etc & their characteristics. I entered it into the calculator so it would ask you questions and tell you who you were thinking about. That was one of the ridiculous ways I creatively passed the time in Study Hall back in the day. Nowadays I try to avoid programming & code if at all possible. Graphic interfaces are much more appealing to me. After Sunday dinner at my parents' house, my family can be found watching The Simpsons without fail. I used to stay up really late when I was a kid, so I remember seeing the original Simpsons shorts on the Tracy Ulmann Show. Anyway, Ralph Wiggum is one of the great characters in Springfield. My sister & I frequently quote his innocently wacky sayings. In fact, he was actually my first choice for President of the United States. On Neatorama, I saw a link to a Ralph Wiggum quiz, so I couldn't resist. I missed 3 & scored 80%.